American flags, an early Fazino painting and a vivid Heriz carpet were some of the top lots from recent auctions around the United States. Check them all out in this week’s Across The Block. NEW YORK CITY – Swann Galleries’ auction of printed and manuscript Americana on April 12 was the department’s highest-grossing sale in four years, continuing an upward trajectory as each offering of Americana and African Americana becomes more curated. Highlights of the sale included historic bibles and a broad selection of unique and manuscript material. 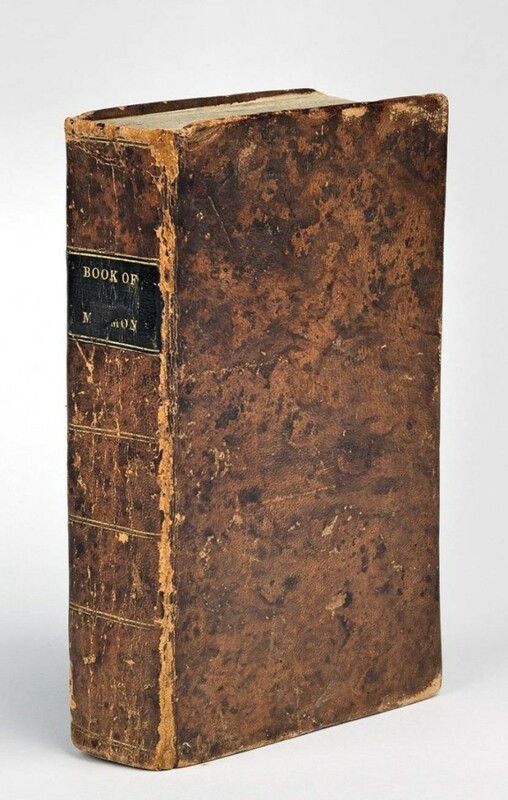 Religious texts constituted many of the highlights of the sale, including an unusually well-preserved first-edition Book of Mormon, Palmyra, 1830, which topped the auction at $77,500, going to a collector. For more information, 212-254-4710 or www.swanngalleries.com. SEABROOK, N.H. – On March 26, bidders were happy to wave their card for flags at the Beattie and Bider Auction. A 13-star antique American flag deaccessioned by the Flag Heritage Foundation with the inscription, “Carried By The Massachusetts Regiment The time the Americans won their Independance [sic] 1776-1777″ drew a great deal of interest nationally and sold for $7,000. A 34-star American flag brought $1,000, and an oversized 38-star example realized $500, shown here being sold by auctioneer Ed Beattie. For information, 508-633-4858 or 603-770-9878. BELLPORT, N.Y. – An estate auction conducted by Thos. 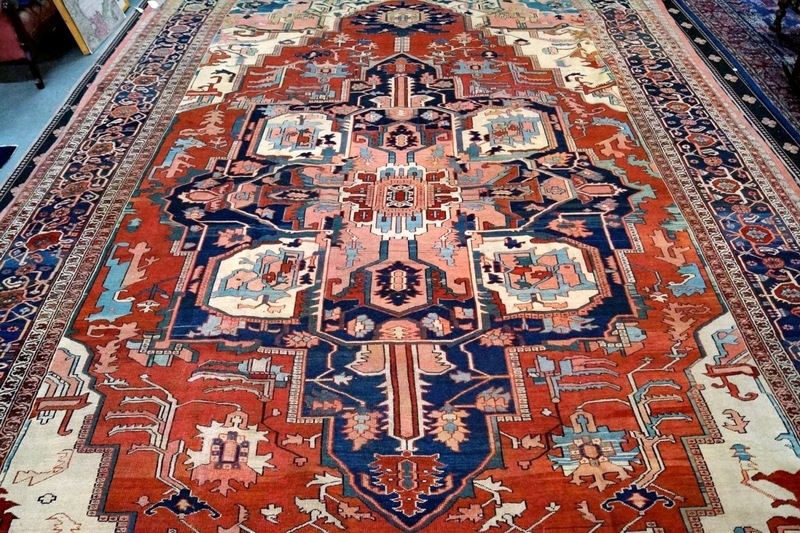 Cornell Galleries on April 21 was filled with Eighteenth-Twentieth Century Furniture and fine art, but it was a wonderful circa 1920 Heriz carpet, 18 feet 6 inches by 11 feet 4 inches, sold for $10,200 that achieved top lot status. For information, 631-289-9505 or www.thoscornellauctions.com. CORNWALL-ON-HUDSON, N.Y. – American and European paintings, Audubon prints and the contents of a local antiques shop crossed the block at Mid-Hudson Auction Galleries on April 21. 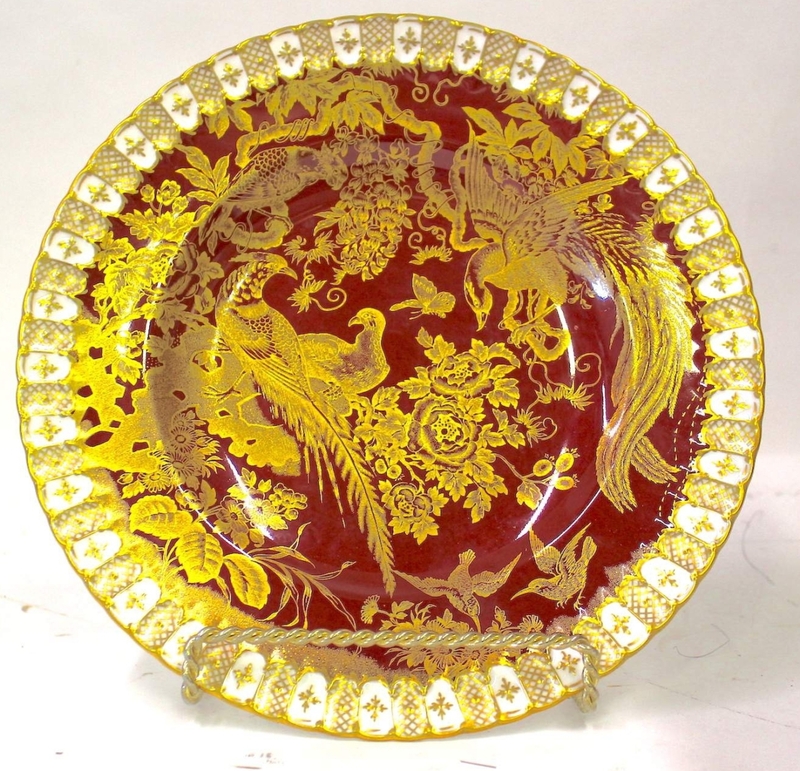 Auctioneer Joanne Grant said that a Royal Crown Derby china service for 12 in the Paradise pattern captured $4,575 at the sale. For information, 914-882-7356 or www.midhudsongalleries.com. CHEVY CHASE, MD. – With nary a Tweet among them, a red quarter-leather-bound collection of autographed presidential letters, notes and documents – Washington through Franklin Delano Roosevelt – was bid to $31,125 at Sloans & Kenyon’s estate catalog auction on April 21-22. The collection was published by the Gravure Company, New York and Washington and included autographs and some signed documents. For information, 301-634-2330 or www.sloansandkenyon.com. MAPLE GLEN, PENN. – Locati presented its online sale April 2-16, comprising nearly 400 lots of porcelain, fine art, silver, jewelry, furniture, Asian art and more from local estates and collections. 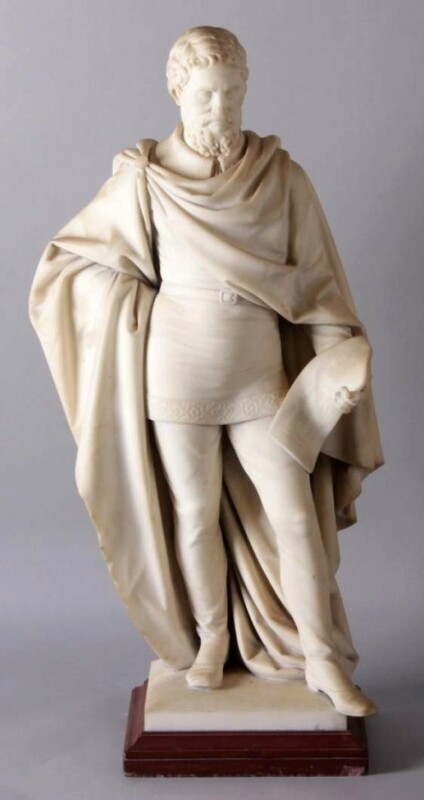 Among the highlights were a Carl Johann Steinhauser (German, 1813-1879) marble sculpture, which sold for $4,000, a group of Chinese glass snuff bottles that were bid to $3,100 and three pairs of antique 14K gold earrings, which sold for $2,200. For information, www.locatillc.com or 215-459-1007. ST LOUIS – Modernism was on the menu at Selkirk Auctioneers & Appraisers on April 21 when an oil on canvas,”Resquicio,” by Jose Antonio Fernandez-Muro (Argentinian, 1920-2007) sold for $45,600. 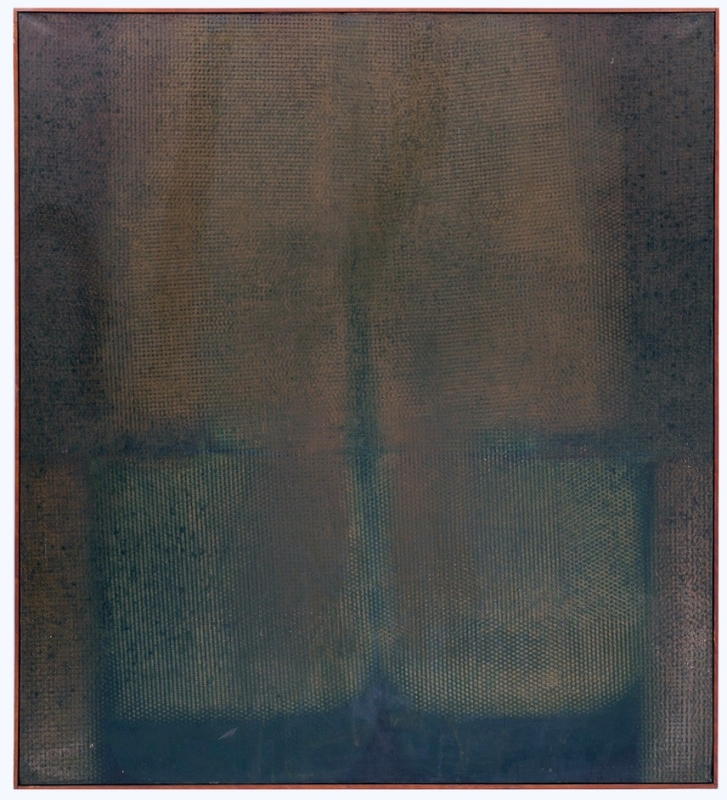 Signed and dated 1961 verso, the large stretched canvas was a study in gradations of dark green, measuring 64 by 58 inches. This piece was exhibited at the Bienal Americana de Arte 1962, Córdoba, Argentina, and formerly housed in the collection of the Oakland Art Museum. MOUNT KISCO, N.Y. – The Benefit Shop Foundation can be counted on to have at least one striking piece of art in its monthly Red Carpet auctions. The foundation’s auction on April 18 was no exception. Among the standout artworks was a rare and early folk art painting by Charles Fazzino (b 1955), dated 1983, which rose to $5,715. The artist is better known for his silkscreen serigraph 3D-style constructions that he turned to later. 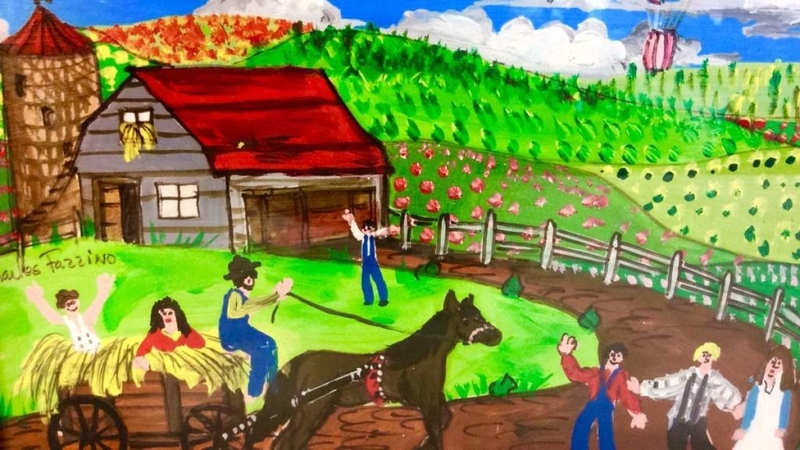 This 13-by-11-inch painting depicts people on a farm, a hot air balloon and a horse-drawn wagon filled with hay and riders. The consignor’s parents purchased the painting while Fazzino was living at home in New York with his parents. For information, 914-864-0707 or www.thebenefitshop.org. 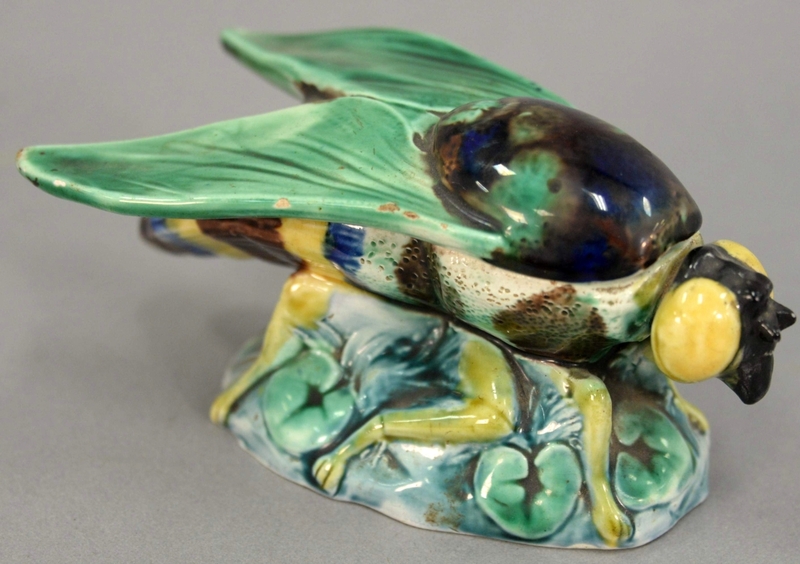 WINDSOR, CONN. – Selling for $2,304 on April 21 at Nadeau’s Auction Gallery was the proverbial “sleeper” lot – a Wedgwood majolica fly match box that flew past its $500 low estimate and landed among the top lots of the day. Having wings cover the opening to a hollow body on lily pad and leaf base, the 2½-inch-high-by-5¼-inch-long charming match box was from the private estate of Faith K. Tiberio of Sherborn, Mass. For information, 860-246-2444 or www.nadeausauction.com. LONDON – A pair of gold pendant earrings from the collection of Maharani Jind Kaur, the mother of the last Sikh ruler of the Punjab, sold at Bonhams Islamic and Indian sale on April 24 for an impressive $244,000. 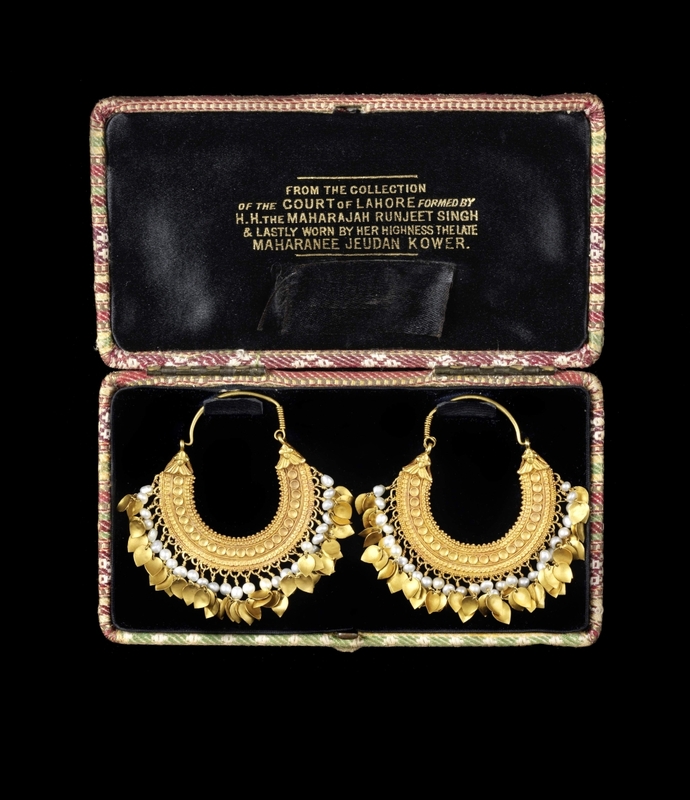 The earrings had been estimated at $28/42,000. Bonhams head of Islamic and Indian art, Oliver White, said, “These gold earrings are a powerful reminder of a courageous woman who endured the loss of her kingdom, and persecution and privation, with great dignity and fortitude. The impressive price paid for these beautiful pieces of jewelry conveys their significance.” For information, +44 20 7447 7447 or www.bonhams.com.